Hope you all had an amazing Christmas & got to spend time with family, friends and your loved ones! I had a fantastic day which started with a breakfast of these delicious Blueberry Pancakes. I used this recipe with the addition of frozen blueberries in the batter. Nibbled on some cheese, chocolate and Fruit Cake which had time to age for more than 3 weeks. Took a walk with hubby. And spent the rest of the day watching Miracle on 34th street & It’s a wonderful life, cozying up in a blanket. It was indeed a wonderful day! Today I have got you a perfect holiday entertaining recipe. 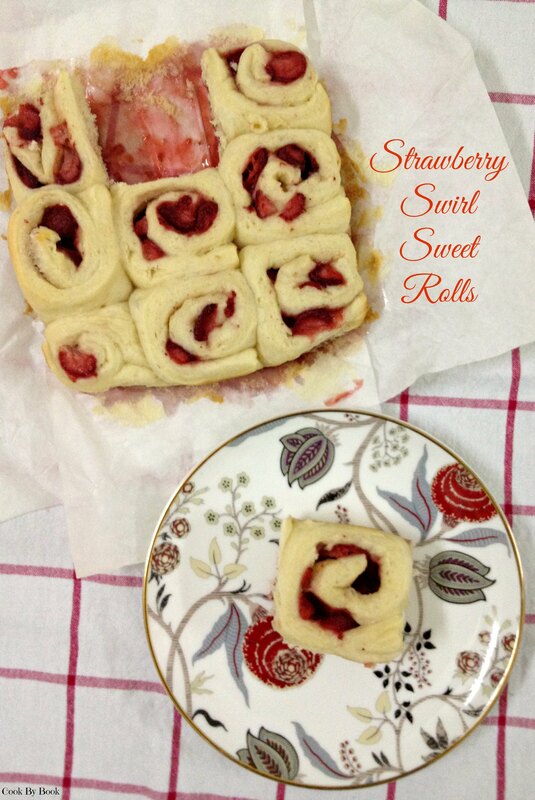 Ring the morning of 2014 with these juicy, sticky and sweet strawberry rolls. They are tender and puffy, utterly soft and buttery. Totally melt-in-your-mouth-experience! Plenty festive too! Double this recipe if you’re serving a larger crowd. 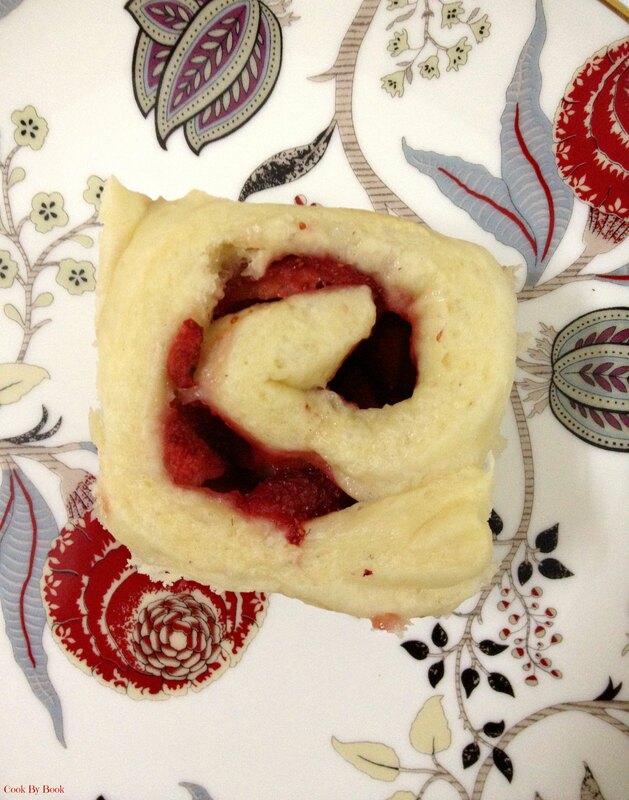 You can freeze the extra rolls sans the glaze and reheat them in micro when sweet roll cravings hit. Also, I do not have pictures with the glaze but it is absolutely necessary to top these with glaze. Okay, it is up to you to decide (Nope, glaze is MUST!). Not that I am pushy but the glaze makes them sweeter and better! MAKE THE DOUGH: In a small saucepan, warm the milk over low heat until warm (No need of using thermometer but about 95ºF). Pour the warm milk into the bowl of a stand electric mixer fitted with the dough hook and manually stir in the sugar and yeast. Let stand until the yeast is foamy, about 5 minutes. Add the softened butter, egg, zest and salt. Scrape down the sides and manually stir as needed. Gradually add flour and beat at medium speed until a soft dough forms. Increase speed to medium-high and beat until the dough is soft and supple, about 10 minutes longer. *If you do not have a stand-mixer with a hook attachment, knead the dough by hand in this step.Transfer the dough to a lightly floured surface and knead it with your hands for about 2 minutes. *You may add little more flour if the dough is still too sticky to handle at this point. Form the dough into a ball and transfer it to a lightly greased bowl. Cover the dough and let sit in a warm place until doubled in size, 1 to 2 hours. Line the bottom of a 8×8 inch baking dish with parchment paper,leaving room on the sides. Turn the dough out onto a lightly floured work surface and, using a rolling pin, roll into a 10×14 inch rectangle. I used a ruler for accuracy. Make sure the dough is smooth and evenly thick, even at the corners. MAKE THE FILLING: In a medium bowl, toss the frozen strawberries slices with the lemon zest, sugar and cornstarch. 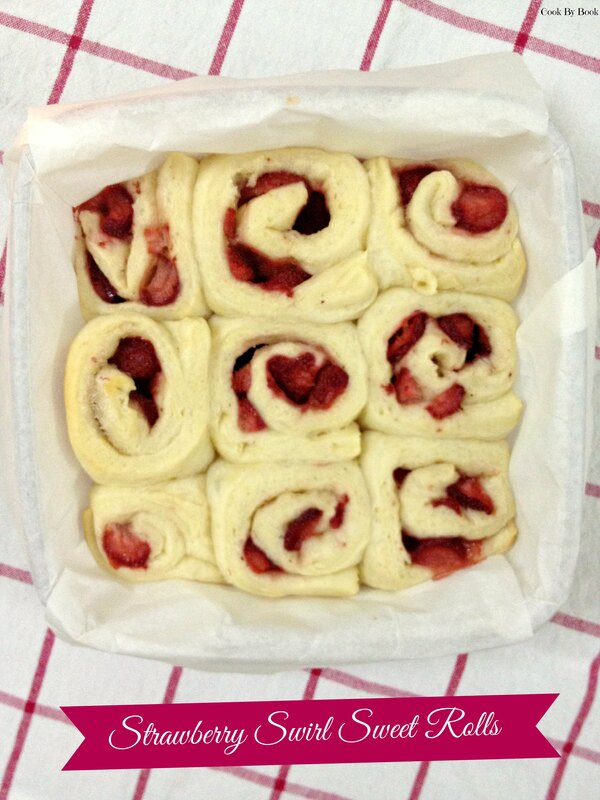 Spread the cold sugared strawberries evenly over the dough. Tightly roll up the dough to form a 14-inch-long log. Cut into 9 even rolls (about 1.5 inches in width each). Arrange them in the prepared baking pan, cut sides up. Cover the rolls and let them rise in a warm place until they are puffy, about 2 hours. The berries will release their juice at the bottom of the pan – this is OK.
Preheat the oven to 200ºC/400ºF degrees. Cover the rolls with aluminum foil and bake for about 20 minutes covered and 5 minutes uncovered, until they are golden and the berries are bubbling. Transfer the pan to a rack to cool for about 15 minutes. MAKE THE GLAZE: In a small bowl, whisk the confectioners’ sugar and cream/milk until smooth. Add more sugar or cream, depending how thick you want the glaze. Pour glaze over the rolls and serve warm. *Make Ahead: During the second rise, cover the sliced rolls and let sit overnight at room temperature before baking. 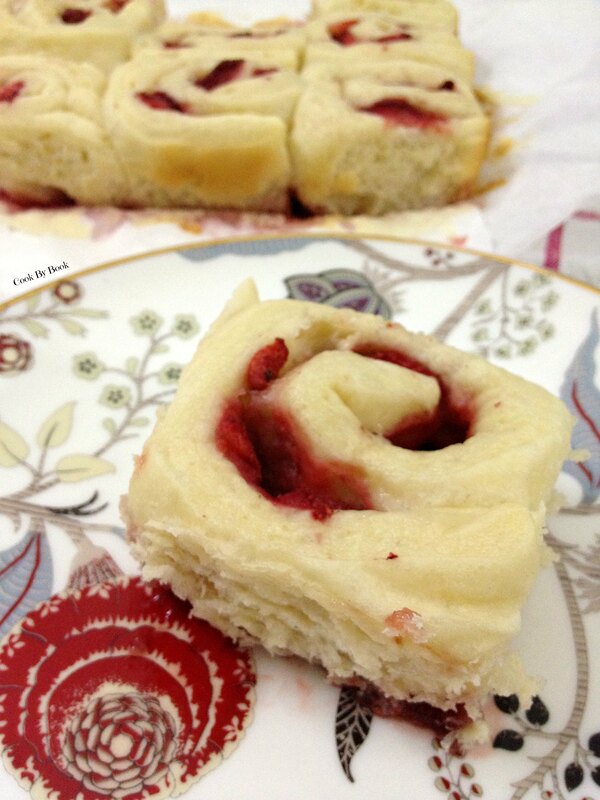 Baked rolls sans glaze can be frozen up to 2 months and warmed up to enjoy at a later date. Glaze right before serving. Thank you Laura! You’ve always been so kind with your words! I’m sure you had a beautiful Christmas surrounded by beautiful people!